On August 29, in a historic moment in the history of the planet, the 35-member Anthropocene Working Group (AWG) reported to the International Geological Congress that the Anthropocene epoch in geological history is “stratigraphically real” and should be dated as arising around 1950, displacing the Holocene epoch of the last 12,000 years. The AWG has yet to arrive at a formal decision that would adopt a definite global “signal” (though ten of the thirty-five members currently support using fallout radionuclides from atomic weapons testing as the signal), which would be followed by the designation of a “golden spike” or actual location in the rock, sediment, or ice strata. Yet the general parameters of the onset of the new epoch are clear. The AWG hopes to identify a signal and a global spike location within 2-3 years, and then submit a formal proposal for adoption by the International Commission on Stratigraphy and the Executive Committee of the International Union of Geological Sciences. As Colin Waters, secretary of the AWG, explained: “Being able to pinpoint an interval of time is saying something about how we have had an incredible impact on the environment of our planet. The concept of the Anthropocene manages to pull all these ideas of environmental change together.” Most importantly, it tells us that the world economy has generated an anthropogenic rift in the Earth system threatening millions of species, including our own, requiring fundamental changes in the way in which society relates to the earth through production. See Ian Angus, “Expert Panel: The Anthropocene Epoch Has Definitely Begun,” Climate and Capitalism, August 29. See also Ian Angus, Facing the Anthropocene (New York: Monthly Review Press, 2016). As of this writing in late August 2016, it appears that the November elections in the United States will turn once again, and perhaps to a greater extent than at any time in recent memory, on issues of race. There are of course many other pressing problems, including climate change, economic stagnation, militarism and imperialism, class and gender inequality, the privatization of public education, and the implosion of the national health system. But it seems likely at this point that the race issue will override all other questions. Even Hillary Clinton’s fearsome imperialist and warlike tendencies seem less dangerous in the view of some on the left than what is often characterized—including by such noted MR and Monthly Review Press authors as Henry Giroux, Gerald Horne, and Cornel West (the last a strong supporter of Green Party candidate Jill Stein)—as Trump’s “neo-fascist” proclivities. Under these dire circumstances, deep divisions have naturally emerged among U.S. socialists and radicals as to whether to vote for the lesser among two great evils, to vote one’s conscience by opting for a third party candidate, or not to vote at all. Yet, if leftists are bound to differ with respect to their electoral stances under such “damned if you do, damned if you don’t” circumstances, we can at least point to some of the contradictions and dangers associated with the current election cycle, which, regardless of the final outcome, point to deep fissures in the road ahead, and the need to develop new, more radical strategies for the future. Clinton as former secretary of state (during which she in effect took over much of the position of secretary of defense as well) has been associated with the promotion of imperialist war and regime change around the globe, rivaling the misadventures of war criminal Henry Kissinger. Her political campaign has heavily emphasized her qualifications not so much for the office of president as that of commander in chief. If U.S. imperialism is hardly in dispute in this election (despite Trump’s surface isolationism), Clinton has made no bones about her intention to extend the U.S. empire by virtually any means necessary. Surrounded by neo-conservative warmongers, she has advocated policies—such as a “no-fly zone” in Syria—that would raise the danger of nuclear war to the highest level ever, or at least since the Cuban missile crisis. Her new Cold War approach to Russia pushes the doomsday clock that much closer. Nor should anyone doubt that both Clinton and Trump are equally the candidates of financial capital in this election. One has notoriously declared her subservience to Wall Street; the other is a multi-billionaire mogul and New York real estate speculator tied directly to Wall Street. When it comes to climate change, only the Green candidate, Jill Stein, has put it at the center of her campaign. Clinton has given it bare mention, while Trump has denied it altogether (a position made more “viable” by the decline of science education in the United States—with a National Science Foundation poll in 2014 revealing that a quarter of U.S. adults believe that the sun revolves around the earth, a number not too far from the percentage of outright climate denialists). Indeed, it is hard to look at this presidential race without recognizing that the ruling class of the United States is losing both its confidence and mental balance. Although still the hegemonic power, the United States now rules over a declining empire—one characterized by open racism, naked imperialism, permanent war, state terrorism, economic stagnation, widening inequality, accelerating climate change, declining education and public discourse, and collapsing health systems. Even the stabilizing and legitimating functions of its electoral exercises are increasingly less and less effective. All of this means that the formation of a truly revolutionary response to today’s crisis of capitalism is needed more than ever—for the sake of the “wretched of the earth” and future generations. Brett Clark, coauthor of this issue’s Review of the Month and associate professor of sociology at the University of Utah, presided this August, as the elected chair, over the meetings of the Marxist Sociology section of the American Sociological Association (ASA), held in Seattle. Among the papers presented was one by Howard Waitzkin and Ida Hellander on “Obamacare, the Neoliberal Model, and the Movement for a Just and Sustainable Health System,” in which they provided much of the analysis of their coauthored article on the subject published as the Review of the Month in the May issue of MR. Another paper presented to the section was “Marxism in the Anthropocene: The Left and the Great Climacteric” by MR editor John Bellamy Foster. 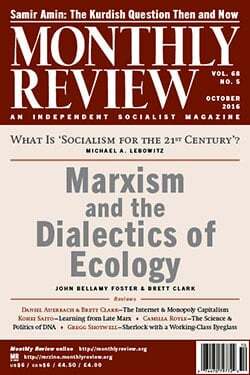 A version of this analysis has now been published, under the title “Marxism in the Anthropocene: Dialectical Rifts on the Left” in the September issue of International Critical Thought. Those interested can find it at johnbellamyfoster.org. Two congratulations are in order. Howard Waitzkin was a co-winner of the 2016 Lifetime Achievement award of the Marxist Sociology section. Congratulations, Howard! Leontina Hormel, associate professor of sociology at the University of Idaho and author of “Marx the Feminist?” in the January 2016 issue of MR, has taken over as the new elected chair of the section. Congratulations, Leontina! Correction: In the September 2016 Notes from the Editors, a reference to Labour Party membership as “the greatest number since the Second World War” was incorrect. Party membership has dramatically increased, but is still well below its peak of over one million in 1952.